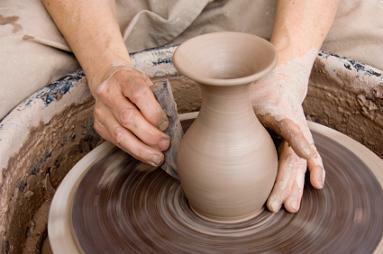 Pottery prices vary with the style of pot. Antique Roseville pottery is collected not just for its understated Arts and Crafts style beauty but for its charm as Midwest Americana. Its pieces are some of the most beautiful American antique vases, bowls, and wall scones, and complement furniture such as antique tables or antique lamps. The Arts and Crafts movement was a response to both political and artistic change. One of its aims was to provide dignity and beauty to the working and lower-middle classes by emphasizing the beauty of handmade artisan objects and, at the same time, to produce affordable goods that added beauty to utility. Roseville was founded in Roseville, Ohio, in 1890, just as the Arts and Crafts movement was reaching its heights. J. F. Weaver, its founder, believed strongly in hand craftsmanship. While Roseville Pottery began with strictly utilitarian items, it started its first art pottery with the Rozane line (the name combines Roseville and Zanesville, where Weaver bought up other potters). Della Robbia. This was a sculpted line that cut away parts of the surface and added three-dimensional decoration in these areas. The decorations came from a wide variety of influences, from folk art to ancient Egyptian and Persian design. Donatello. These sculptural pieces feature slightly classical-style cherubs and trees and soft ivory and green color schemes. Think Wedgewood as redesigned by, say, Beatrix Potter. Egypto. Cool greens, either pine or celadon, with Egyptian-inspired shapes. Most of these designs have very little in common with their namesakes--no Mongol or Aztec would recognize their influence without a lot of hints-but a touch of the exotic, if only in the name was a valuable selling point. These early pieces are the most valuable, partly because of their age, partly because they are entirely handmade. Most sell from $1,000 to the upper thousands in stores or at antique auctions. In 1910, Weaver had pieces made from molds and hand-decorated, considerably reducing production prices while retaining the artisan touch. Frank Ferrell, a local, took over as art designer in 1918 and left only in 1953 when Roseville Pottery closed for good. He not only provided artistic oversight but made the originals for some of Roseville's best loved designs. Pinecone. This is the best-selling line in a wide range of shapes and colors. The predominant color schemes are either browns and greens or clear blues. Wisteria. These are some of Roseville's most sensuous designs, combining purple blossom, green foliage, and brown background on graceful shapes. A bit more contrast than many designs. Futura. This line is inspired by Art Deco's more geometric shapes but still distinctly Roseville. Even experts have a difficult time distinguishing genuine antique Roseville pottery from the false, partly because the Roseville company was not consistent about applying its marks, partly because there were so many contemporary imitators, and partly because there are so many antique reproductions being made today. Most of these are from China and they often include misleading marks, including the word "Roseville." Carefully applied glaze. Roseville was known for its meticulous glazing, so drips or smears, or simply a dull or flat glaze, are an immediate indication that a piece is very likely to be an imitation. Solid weight. Roseville used denser clay than most of its imitators. Light but sturdy handles. Most imitations have bulkier handles than the originals. Attention to details. If details aren't sharp and clear, it's very likely a fake. Subdued but glowing colors. Bright or muddy colors are both bad signs. Prices. If it's in an antique store or sold by an antique dealer and the price is less than fifty dollars, it's either damaged or not Roseville. Roseville is so well known these days, thanks to several taste revivals, that the odds of finding an undervalued piece are only a bit better than lottery tickets. The Roseville Exchange is a wonderful source for information about fake marks, colors and styles that Roseville never produced, and other indicators of imitations.